Episode 63 | Jason Griffey on ethically designing a service to heatmap physical spaces that respects users’ privacy — on open software, to boot. 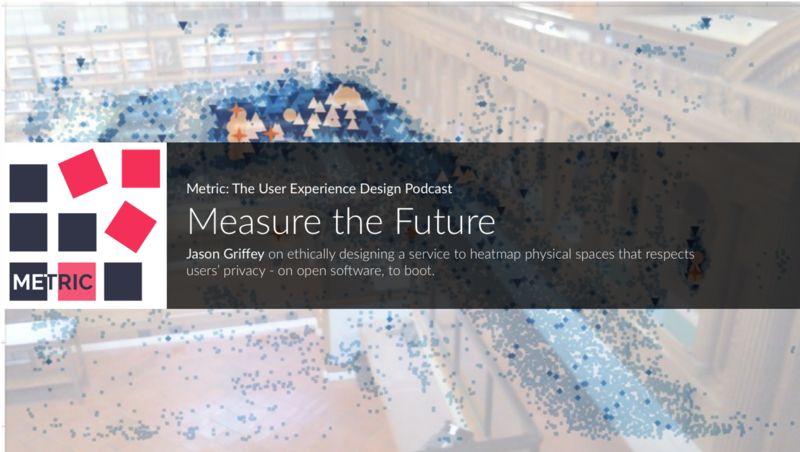 In this episode of my user experience design podcast Metric, Jason Griffey and I talk about Measure The Future, a privacy-conscious human heatmapping service demonstrating how moar data and user privacy aren’t mutually exclusive. A full transcription is in the works. I put together fit-for-reading and linked-up transcripts for newer episodes — like this one — but they take awhile to get right. If it’s your thing, consider subscribing to my newsletter Doing User Experience Work to get notified. You can also get episodes early and support the cost of transcription by pledging just $1/month on my Patreon: https://www.patreon.com/michaelschofield.